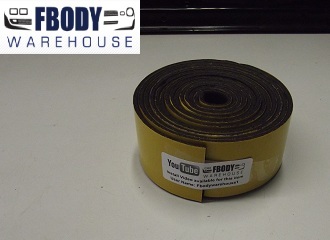 This is a 10 foot section of general adhesion insulation tape! This is an amazing product that can be used for multiple purposes! This is a foam type of insulation that is excellent for any type of duct work, door rattles, trim panel rattles and to wrap dashboard duct-work couplings., or just about anything you can think of! This has a sticky side and a non sticky side. Each unit is 10 foot long, 1/8 in thick, and 2 inches wide. Can be very easily cut with scissors or razor blade! Great to have at your shop or garage as you will be surprised once you have a roll how many different applications on your car this can be used for!